Vidworkz is an all-in-one video marketing platform that allows you to create videos quickly online by entering a few details and picking a few selections. Your videos are then auto-uploaded to sharing accounts via API and then those share are syndicated to your social networks. 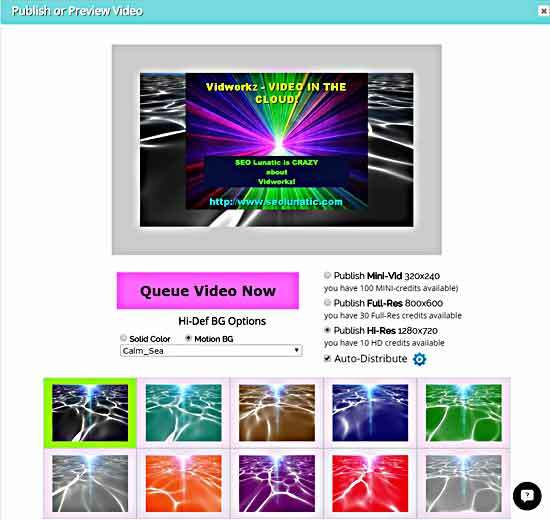 Vdiworkz has a self-contained library of thousands of images, videos and audio clips for you to use when putting together your videos. And the best thing about it all is that you don’t have to download any software or upload any videos because Vidworkz does it all for you in the cloud. Try Vidworkz today by visiting the Vidworkz website at vidworkz.com.